Got a burn? The solution to your pain is right in your fridge! Burns hurt!! The immediate remorse – you knew you shouldn’t have touched that (and would take it back if you could). The instant pain. Your stomach in knots. Ugh! You have things to do – a burn is going to slow you down and be a painful reminder for a week! Who has time for that? The solution is in a bottle in your fridge right now! 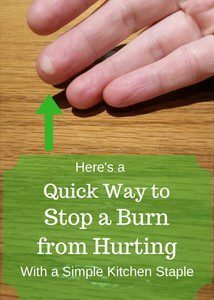 When I first heard about this magical solution for burns – I was skeptical. Like you are now. Then I tried it. Keep an open mind. It was like a choir of angels singing as the pain magically disappeared. I was so glad I gave it a shot – and you will be too. Yellow mustard is magical on burns – not just your hot dogs people! You put a generous dollop on the burn (cold mustard feels great). Then magically the pain will subside. Once it starts to hurt again gently wipe it off and apply another generous dollop. This will be every minute for the first 5 minutes after you are burned. I’ve heard others say to keep the mustard on until it dries. That didn’t work for me. 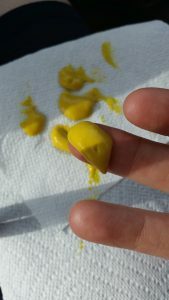 The pain relieving properties of the mustard diminished as it cooled. So I kept reapplying. Mustard is cheap and burns hurt – no brainer. After about 5-10 minutes it should stop hurting so much and you only need to apply as needed. You should apply the mustard as quickly as possible after you are burned. Thankfully you were probably in the kitchen when it happened. 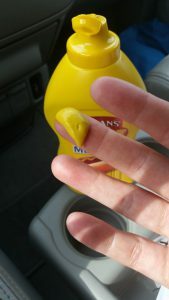 That bottle of mustard is super convenient! I have had several burns that would have turned into a blistery mess. Instead, they heal and go away with no blister at all. But only when I applied mustard to them immediately. I was amazed. The latest burn in the pictures was a pretty bad burn that still blistered. Now you know the secret to eliminating burn pain, share it by clicking on one of the icons to your left. Next burn we will all be armed and prepared – with our yellow mustard! Do you know the right way to cut up an onion? 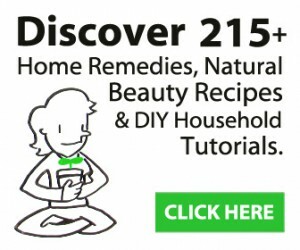 Learn the fast and easy way without tears! Never cry over another onion. How to easily cut up a pomegranate – huge time saver! Q. Can I use a different type of mustard than yellow? A. Yellow mustard works best. Others can be used in a pinch, although you might have diminished pain relieving effects. Q. Certain brand to use? A. Nope – just regular yellow mustard. 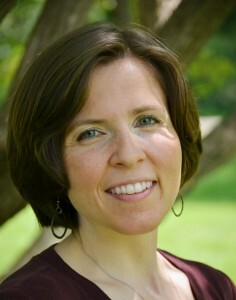 I’ve used French’s, Heinz, and Aldi brand – all with success (yes I am accident prone). Q. What type of burns can I use this on? A. I have used in on mild burns I get in the kitchen. Mostrecently an electrical burn from trying to fix something in my car (Whoops!). Use your discretion, if you get a major burn go to the ER. Q. When Should I apply the mustard? It should be applied immediately after you are burned. As soon as possible is always best. Q. What can you do to stop the mustard from staining? A. I’ve tried to apply the mustard and put a bandaid over it so it wasn’t so messy. It didn’t work out for me. You have to change it so often it wasn’t worth it. I recommend taking 5-10 minutes to just relax and apply the mustard. If you have a secret to keep applying it in a less messy way – I’d love to hear it. Q. Why does mustard work for burn pain? A. I’ve heard some say the vinegar is what helps yet never found a conclusive reason. All I know is it does work. Although here is a interesting article from the National Mustard Museum if you want to know more. If your burn happened a few days ago – Dr. Axe gives a few options to help speed up the healing process.